Not only are jets, pilots and support crews from the both the Florida and Oregon National Guard actively deployed to Europe, but The 159th Fighter Wing, of the Louisiana National Guard, are now forward deployed in Bulgaria under exercise Thracian Eagle, 2015. Thracian Eagle has Air National Guard Eagles of the ‘Bayou Militia’ flying with and against Bulgarian MiG-29 Fulcrums and Su-25 Frogfoots, as well as Bulgaria’s Soviet-era surface-to-air missile systems, which include SA-10 (S-300), SA-5 (S-200) and SA-6 (2K12) batteries. Bulgaria maintains a fairly meager air arm, consisting of about 16 old MiG-29 Fulcrums, a dwindling fleet of MiG-21 Fishbeds (numbers range from 3 to 12 as far as how many remain operational), as well as about a dozen aging Su-25 Frogfoot close air support aircraft. Bulgaria seems committed to concentrating on maintaining their MiG-29 force, upgrading it to a NATO compatible standard in a very similar fashion as Poland’s Fulcrum force. Still, with such a small and geriatric fleet, and with Russia’s more aggressive stance in the region, sending even one jet away for a long upgrade process is a challenge for the Bulgarian Air Force. Still, the powerful MiG-29, its helmet mounted sight and its AA-11 Archer short-range air-to-air missile remain a real threat at close range to even the most advanced fighters flying today. Update: It now seems that Russia’s price for keeping the Bulgarian Fulcrum fleet in the air is too expensive and that Bulgaria may look elsewhere for a new primary fighter aircraft, including surplus F-16s from the US. The Louisiana Eagles and their 150 or so person support team are stated to stay at at Graf Ignatievo airbase through the exercise, which ends next week. Meanwhile, the deployment of Florida and Oregon Air National Guard F-15Cs will soon migrate east, to Bulgaria as well. It is not clear if there will be some overlap of both deployments. 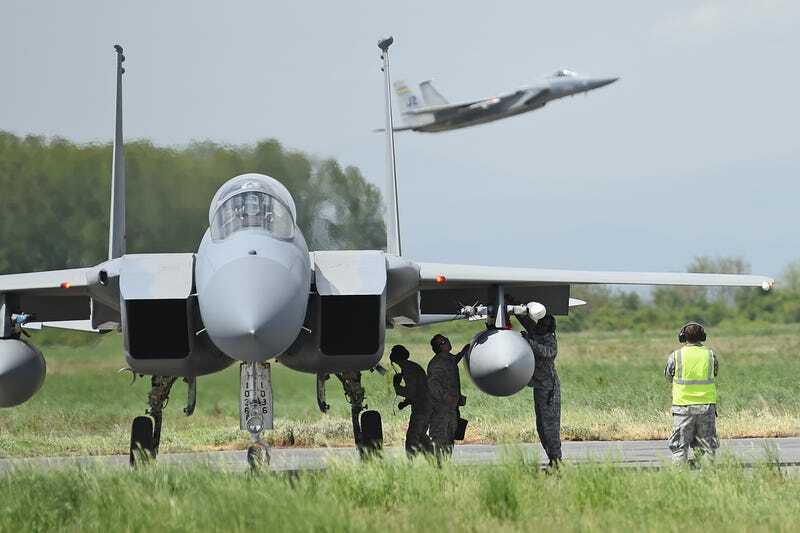 If so, three out of the Air Guard’s five F-15 fighter units will have a presence in Bulgaria at the same time, making up a formidable deterrent force vis-a-vis Russia, probably the most powerful of its kind since the start of the seemingly ever growing Operation Atlantic Resolve.